One of the best white flowering Pieris varieties is Pieris ‘Temple Bells’. Grown for the masses of white bell shaped flowers in spring, it also has very attractive foliage. The flowers in spring are followed by a flush of new red growth, by summer this has turned to mid green. Reaching round 1m in height and up to 2 metres in good conditions this species is from the Ryku islands of Japan. 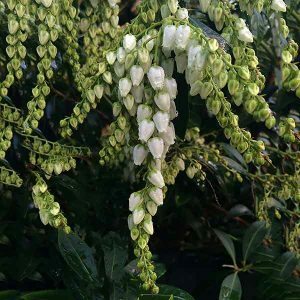 We think that Pieris ‘Temple Bells’ is best as a stand alone feature plant, this gives it a chance to display its flowers at their best. It can be used in the garden border in a mixed planting, or grown as a low hedge. Also suited to growing in containers it does make a good plant for a shady courtyard. Best grown in a position where it receives good light, yet protection from the het of the afternoon sun in summer. A humus rich well drained soil is best. Grow it among Camellias and Rhododendrons as Pieris ‘Temple Bells’ performs well in a slightly acidic soil. After planting, hate run well with a liquid seaweed fertiliser. Water regularly through the first summer. Fertilise with slow release Camellia fertiliser in early spring. Repeat this at the end of summer, remembering to water well both before and after fertilising. A little top dressing with well rotted compost, and a re application of mulch each spring will keep the plant in good condition. Spread – Upright however will spread to 1.5meters over time. Position – Protected from very hot sun, dappled shade to morning sun. Flowers – White Bell shaped. Good range of Pieris japonica, Fruit Trees, Roses, Perennials and annuals. Includes Avocados for cold climates, persimmon and Olives.